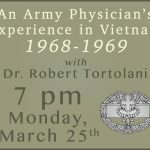 At 7 pm on Monday, March 25th, join Dr. Robert Tortolani in the Brooks Memorial Liberary Community Meeting Room, where he will share some of his personal experiences during his time of service as a medic during the Vietnam War. He will show slides and a film from his personal collection, followed by an open discussion. 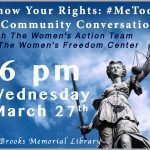 At 6 pm on Wednesday, March 27th, join the Women’s Action Team and the Women’s Freedom Center at Brooks Memorial Library, for an open community conversation: Know Your Rights in the Era of #MeToo. The #MeToo Movement has clearly changed the cultural landscape. But how do we know if it’s safe to speak about our experiences of harm, especially in public? An informational meeting for anyone interested in joining the River Gallery School art trip to Tuscany in October will be held on Thursday, March 21, 6:00 p.m. at the school, 32 Main Street, Brattleboro. Those interested in learning more about the tour are invited to attend. 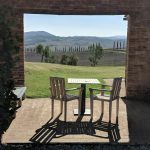 The trip will take place from October 4–11, 2019 in Pienza, Italy, with a three-day, optional stay prior to the tour in Cortona from October 1–3. The tour is sponsored by the River Gallery School and organized by Travel Fever Tours of Putney. 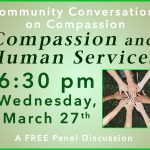 Join us at 6:30 pm on Wednesday, March 13th, at Brooks Memorial Library, for the first of a series of FREE, open panel discussions designed to highlight the compassion issues in our town, responses to date, and priority needs to be addressed. 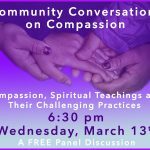 This week’s discussion is: Compassion, Spiritual Teachings and Their Challenging Practices. Speakers will include: Yasmeen Chaudhri (Islam), Dek Fromer (Baha’i), Duncan Hilton (Christianity), Kate Judd (Judaism), moderated by Rev. Scott Couper, Minister of Centre Church. For many years, I thought being a couch potato was a function of personality — some people are couch potatoes, some aren’t. I even felt virtuous about how much more productive I was not spending hours laying around watching tv. It never occurred to me to ask why I was so virtuous until I got a sofa myself, one positioned in a living room with a screen in front of it. Then I knew — my previous self hadn’t been a couch potato because she hadn’t had a couch. 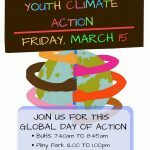 On March 15th, youth across the world, youth will be gathering to focus the attention of local, state and national legislators on protecting our resources and environment. 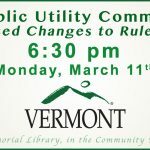 Join young people of southern Vermont to demand that our lawmakers work to steer us from climate disaster, and protect our frontline communities who are already suffering the consequences of it. 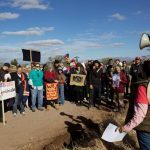 Gather peacefully to share ideas and ensure that future generations can live to experience a healthy natural world. Bring signs, songs, and knowledge. Bring your stories and passions. Bring respectful arguments, and a willingness to listen. 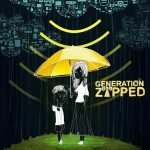 Local homeschooler and Compass grad Cal Glover-Wessel was involved in the making of this documentary. He will be hosting the Q and A after the showing of the film. Please come! 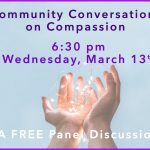 Join us at Brooks Memorial Library at 6:30 pm on Wednesday, March 13th, for a FREE, open panel discussion. Speakers will include: Yasmeen Chaudhri (Islam), Dek Fromer (Baha’i), Duncan Hilton (Christianity), Kate Judd (Judaism), Scott Couper, moderator. 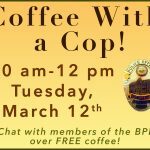 Join us from 10 am – 12 pm on Tuesday, March 12th, as the Brattleboro Police Department presents: Coffee With a Cop! 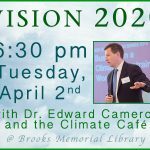 Anyone can enjoy the relaxed atmosphere, and it is and a great way to get questions answered informally.They will be ready to chat about anything — from the Red Sox and the Celtics, to traffic concerns and home safety.